Mark Steven Gubicza /ˈɡʊbᵻzɑː/ born August 14, 1962 in Philadelphia) is a retired Major League Baseball pitcher who played for 14 major league seasons with the Kansas City Royals (1984–96) and California Angels (1997). He currently does color commentary for Los Angeles Angels of Anaheim games on Fox Sports. Gubicza was born August 14, 1962 in Philadelphia. He attended the William Penn Charter School. He was drafted by the Kansas City Royals in the 2nd round of the 1981 Amateur Draft, the 34th overall pick. He began his professional baseball career at age 18 with the Royals Gold in the Gulf Coast League, where he went 8-1 with a 2.25 ERA and 40 strikeouts in 56 innings. He played for Fort Myers in the Florida State Class A League in 1982 and missed most of the season due to injuries. In 1983, he was assigned to the Jacksonville Suns, the Royals AA team in the Southern League, managed by Gene Lamont. Gubicza was 14-12 with a 2.72 ERA, and 146 strikeouts in 196 innings. He made his major league debut on April 6, 1984 against the Cleveland Indians at Royals Stadium. He pitched 6 innings, gave up 5 hits, 1 run, and struck out 4. 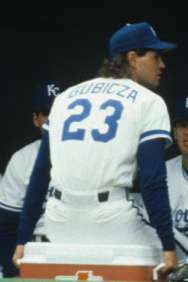 Gubicza was a member of Kansas City's 1984 American League Western Division winning team and as well as their 1985 World Series winning team. However, he didn't get a chance to pitch in the 1985 World Series as the Royals decided to go with a four-man starting rotation. He was elected to American League All-Star Teams in 1988 and 1989. Gubicza finished 3rd in voting for the 1988 American League Cy Young Award after posting a 20–8 win–loss record in 35 games (all as a starter), 8 complete games, 4 shutouts, 269 2⁄3 innings pitched, 237 hits allowed, 94 runs allowed (81 earned), 11 home runs allowed, 83 walks, 183 strikeouts, and a 2.70 ERA. He led the American League in games started in 1989 (36) and 1995 (33). Gubicza has served as an MLB Analyst on Dodgers and Angels pre-game and post-game shows for Fox Sports West/Prime Ticket. In 2007, he was paired with José Mota on fifty Angels telecasts on Fox Sports West/Prime Ticket and KCOP. He also co-hosts Angels in the Infield with Bill Macdonald. The Angels announced that he will work roughly 75 games on television during the 2008 season. Gubizca was slated to work with Rory Markas on Angels broadcasts in 2010 before Markas's sudden death on January 4, 2010. On March 3, 2010, Victor Rojas was named as Markas' replacement. He appeared in 30 for 30: You Don't Know Bo: The Legend of Bo Jackson, which first aired on 8 December 2012. In 2005 and 2006, Gubicza was the Head Baseball Coach at Chaminade High School in West Hills, California. One of the students he coached was Kevin Pillar, now the center fielder for the Toronto Blue Jays. Gubicza's son, Chad, attended Chaminade. ↑ "Mark Gubicza". baseball-reference.com. Retrieved 9 October 2015. ↑ "2nd Round of the 1981 MLB June Amateur Draft". baseball-reference.com. Retrieved 9 October 2015. ↑ J. Brady McCollough. "A Royal Entrance". Retrieved 2012-05-04. ↑ "30 for 30". IMDB. ESPN Films. Retrieved 9 October 2015. ↑ "Ex-pitchers now manage high school teams". ESPN. 23 March 2005. Retrieved 9 October 2015.